As a writer, I like to keep it simple. A spiral-bound notebook and a no. 2 pencil sharpened to a precise point are all I need to make my ideas a reality on the page. I love the sound of the pencil scritching across the paper. It’s the sound of progress being made. But every now and then, a writer needs to raise the quality of her writing instrument if for no other reason than the sheer pleasure it brings in owning a piece of artwork. 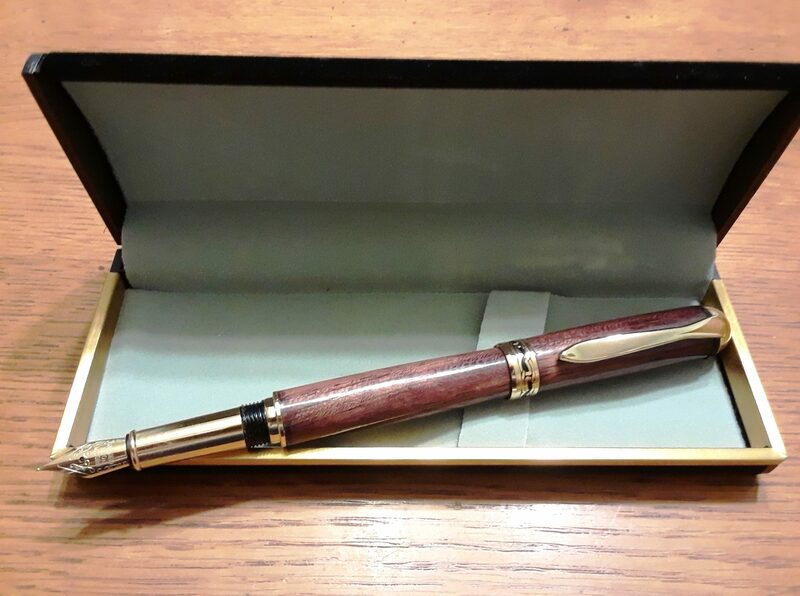 I cannot describe the thrill of writing with my custom-made fountain pen created by woodworker Arthur Miller. So far, I’ve saved my beautiful pen with its specially chosen color of ink for journaling. But art such as Mr. Miller creates is beautiful, functional, and durable. It would be a shame to keep my pen locked away for only occasional use. I simply love the feel of the pen in my hand and how the silky flow of ink makes even a humble grocery list look like a masterpiece of calligraphy. Mr. Miller was gracious enough to share his passion for woodworking and explain the process behind the fountain pens and other beautiful works of art he creates in his studio. I was born in Akron, Ohio. I attended Springfield Township Schools and graduated from Buchtel High School. The Vietnam War was on, so two years after graduating I joined the U.S. Coast Guard. My first airplane ride was from Cleveland to Philadelphia, where I boarded a bus for the trip to Cape May, NJ where I attended boot camp. I have been stationed in Ogdensburg, NY on the St. Lawrence River; Cleveland, Ohio; Honolulu, Hawaii; Cape May, New Jersey; Little Creek, Virginia; New York City, and back to Cape May thus completing thirty years, two months, and fifteen days of service and retiring as a Chief Warrant Officer, CWO4. Following retirement, I worked for a durable medical equipment company, at a hardware store, and at a destination resort in Cape May. I have always been interested in wood turning, and my hobby, now in full force, somehow got out of control. I am married to my first wife, Diana (from Medina, Ohio), and have two married daughters who live close by, and one grandson. How did you develop your interest in woodworking? Was it a career or hobby? How long have you been at it? I have long loved wood. Our childhood home was made from wood of one form or another: barn siding in the kitchen, pine paneling boards in the living room and office, mahogany panels in the bedrooms. The only plaster in the house was in the bathroom. I loved the smell, the feel, and the look of wood since forever except when we moved and I had to remove all the green paint from the oak paneling and woodwork in our new city house. I loved to climb trees and build things from wood. In high school, I took wood shop from Mr. John McKay who further enhanced my woodworking experience. Are you professionally educated/trained in wood working or self-taught? 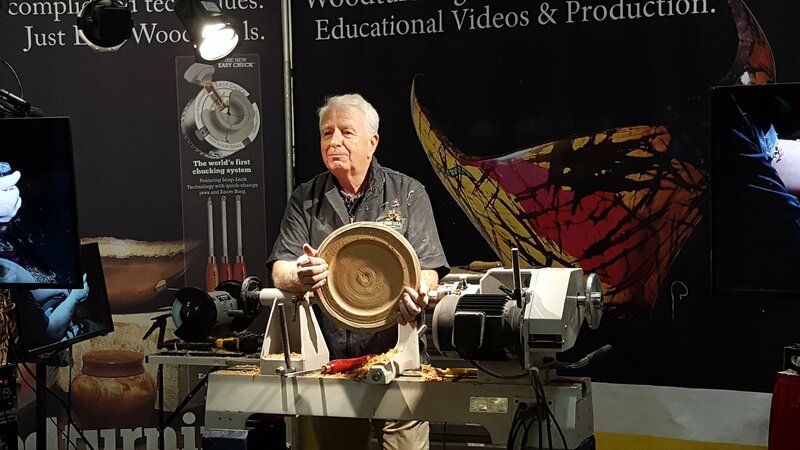 While I have been exposed to several of the foremost wood turners in the country since starting my business, and I don’t make any claim to match them. I am largely self-taught beyond the high school years. What tools do you use in the process of woodworking? For tools of the wood working trade, of course there are the lathes of which I have three: two bench top (a 10 in. x 24 in. and a 12 in. x 24 in. capable lathes) and a larger 16 in. x 36 in. floor model. The smaller number indicates half the distance from the spindle to the bed x 2 which is the maximum turning diameter over the bed. Of course, the lathe can be reconfigured. The headstock can be moved to the end of the bed where by the maximum diameter is half the distance from the spindle to the floor—in my case about 7 feet. I am not turning 7 foot diameter items at this time! Then there are the tools of wood turning. They come in two types: HSS (High Speed Steel) and carbide. The HSS come in several categories, gouges, scrapers, and specialty. This category of tool is sharpened on a diamond grinding wheel. Carbide tools are not sharpened. The cutting surface is replaced when it is no longer sharp. Both tools are important in the studio of Sweet N Round. Resins are another important tool used for casting. What are some products you make from wood? The product line at Sweet N Round is quite extensive. I make Pepper Mills, Salt Mills and Shakers, Coffee Mills, Platters, Bowls, Kaleidoscopes, Pens and Pencils, Sewing and Knitting items (Seam Rippers, Yarn Minders and Yarn Barns, Crochet Hook Sets), Marker Rings, Shawl Pins and Rings, Key Rings, Pill Boxes, Purse Hangers, Clocks, Garden Dibbles, Pizza Cutters, Bottle Openers, Wine Cork Extractors and Stoppers, and many other items. Do you make furniture, sheds, toys, porches, framing, or other large items? All items are made in my studio. Funny, in 1996, my brother-in-law and I built a shed. Soon, since I did a little mechanical work at that time, it was called a “Shop.” Today, that same building is now called my “Studio.” I do make toys—toy tops and kaleidoscopes. Describe the process of making a fountain pen. How to make a pen: first and foremost, select the style pen to make—be it a simple ball point, an advanced ball point, a roller ball, a fountain pen (which also come in simple and advanced), or a dip pen. Most pens share these steps: select the kit (metal parts which will make up the pen), match with the material (see more on material later), we will call this the blank. Mark the blank to maximize the probability the grain will match. Cut to length then drill a proper hole for the tube that holds the workings inside—ranging from 7 mm to 27/67 inch. The drilling is done on the lathe using a special chuck, which holds the material tightly on the lathe, and of course the proper size drill. All brass tubes used on the interior of the pen must be roughed up with sand paper. This process is also done on the lathe using a mandrel. Tubes which will be used in acrylic pens must next be painted white. When the blanks are measured, drilled, and ready, the tubes are glued into the blank using either CA (cyanoacrylate) or two part epoxy glue. You know CA by its more common name, Super Glue. When the glued blanks have set, the next step is to mill the ends of the blanks (make the ends of the pen square with the tube). Once squared, the blanks are almost ready to be turned. Each blank is marked inside to indicate the end. In my shop, the mark is either the nib end or the finial end. In the case of many high-end writing devices, the finial end is larger than the nib end. Finally, the piece is turned. The blanks are mounted on a pen mandrel and turned to the proper sizes—sanded to usually 5000 grit in the case of wood—and then an appropriate finish is applied. In the case of acrylic or other similar products, the blanks are finished to 12,000 grit, polished with cream, and then buffed on the buffing wheel. If wood, the finish may be wax, wax and oil, or CA. If CA is used to finish, seven coats of CA are applied and cured, and then the blank is finished in the same manner as acrylics. What types of wood do you work with? What’s your favorite wood to work with? The most expensive exotic woods used at Sweet N Round are composites. A composite is wood or other material which, standing alone, has no value. The wood or other material is cast in different materials and then cut into blanks. Seashell blanks come to mind. The seashell material destroys regular cutting tools. Think of sanding sand in resin with sand paper. It cannot be cut using a regular saw, drill, etc. We work with local woods (maybe from my back yard), domestic and exotic woods, acrylics, Corian, antler, horn, composites, and other materials. My favorite woods to work with are those that smell nice. Pau Ferro, aka Bolivian Rose Wood, of the Rose Wood family comes immediately to the front. Included in this family is Cocobolo, a wood from Mexico. Many people are allergic to these woods though once finished it poses no issues to the user. What other materials do you work with? I like to turn a variety of acrylic and Corian although at the initial turning stages the chips are shrapnel. One must protect oneself from the hundreds of flying sharp pieces. Also a consideration in wood turning is the dust. Air filters are an absolute must in a closed shop and studios. Masks are also a must to protect the lungs from the dust. However, they also cause the eye protection to fog, so everything comes to a halt until I can see once again. Another wood I use is color wood. Grown in Maine, bass is cut, sliced into thin plies, dyed different colors, glued into slabs, cut to size, and sold to me for a ton of money. Colored wood items, such as mills, sell ten to one over the most beautiful grained cherry, oak, mahogany, maple, sassafras, etc. What has been your biggest challenge with woodworking? Finishing. Most of the time I use a finish called friction finish. It is mostly shellac and carnauba wax. I have no problem with small surfaces, but bigger surfaces are not always so good. I would like to learn lacquer and colors. Many artists love turning a concept into a reality. What is your dream project? I would like to turn items frozen in ice. Assorted shapes, permanently mounted on a base of some type, and then frozen in a block of ice to hold the smaller pieces in position. The result would be perhaps a wood or other material ball with a concave shape cut into it or a pyramid or a box. I’m still thinking about it. What has been your most complex project to date? I’m thinking the most complex, which should be the simplest, drilling a hole through a baseball bat. What do you enjoy most about woodworking and/or working with your hands? I like taking a piece of wood, conceptualizing, mounting on the machine, and then have the wood dictate to me what it wants to be. Does your chosen craft require practice? If so, how much? How do ya get to Carnegie hall? Practice, practice, practice. I often get pieces of wood from someone’s family farm, or the yard, or something Grandpa always liked. The instruction: “I dunno, see what you can get from it”. How critical are you of your own work? I’m pretty tough. My quality control lady (wife) is way tougher. My burn box is full of items that did not make the grade. Of what product/piece/project are you most proud? I like my “Dark Side of the Moon,” my “Lunar Lander,” and my large “Natural Edge Cherry Burl Bowl”—I don’t know what to name it. Do you teach your craft to others? Absolutely. Belonging to the Cape Atlantic Wood Turners, an AAW affiliate (American Association of Wood Turners), one of the missions of our club is to spread the word. Each member has some private instruction arrangement and several of us teach basic wood turning at our local Technical Night School. Do you participate in trade shows, craft shows, lectures, demonstrations, or conferences? Shows are where it is at. I enjoy meeting the people, explaining, demonstrating, showing, and selling my work. It is a joy to see someone come to my table and their eyes just light up. One show, it was a Sunday afternoon, a lady came to my table, and tears immediately filled her eyes. I didn’t know what to think. Her son was about to graduate from college and her husband, a Vietnam Vet, had just passed away. She was looking at my wooden Sierra Vista Pen, which was a rendition of the Vietnam Service Ribbon, in wood. Something we enjoy but have not done a lot is the home parties. Are all your pieces unique? Do you work by commission? I tell people all the time that my pieces are unique. I never (well rarely) measure. If you find two alike, it was an error or a forgery. Bring it back! I am honored when people ask me to do commission work. I once made a lid for the urn for Uncle Fred’s ashes. When I do this kind of work, we understand we will aim for this or that goal. If my work misses your goal, we will try again until you are happy. However, woodworking is an art form. Where would you like to go with your woodworking? I’m pretty happy with where I am though not stagnating. There are items I must make to sell—that is what pays the bills—and there are items I call bait. Be they big or small, bait are items people want to drool over but really, where will they put it or how will they afford it? I like to make captured ring items. Typically a wine glass looking piece with a ring of the stem. Does your skill set include carving or wood burning? I burn my fingers all the time! I do not (have not) carved. Occasionally, I will burn a ring into a piece as accent. Pens, pens, pens. I make usually sixty pens at a time. Pepper mills for the summer. Where is your workshop set up? My shop is at the rear of my home. It is 12 x 16 feet. I have no radio because I want to hear the machines and the work as it is developing. Where can people find you on social media? We call ourselves Sweet N Round, and we can be easily found on Facebook. Sweet: because we are honeybee keepers. We also honor my wife’s heritage as a Medina Bee. Medina is the honey capital of the world and home of the A. I. Root Company—formerly the largest honeybee supplier in the world and now the premier candle producer in the world. Round: well, I make round things.